This live, online course will provide therapists with a clear description of musculoskeletal make-up of the “core” and will cover the research-based neurophysiological rationale for evaluating core development and function in individuals with sensory processing difficulties. Core function will be explored from its developmental roots in the unfolding of the primary movement patterns (innate reflex development). Two key patterns (Moro and Tonic Labyrinthine) and their connections to core development and self-regulation will be discussed. A specific play-based observation tool that identifies core movement challenges and assists in prioritizing treatment strategies will be presented and explored through movement labs. Along with assessment, a variety of hands-on treatment strategies will be demonstrated through interactive, online labs. Video case presentation will be used to show practical clinical applications. Receive the Gertie Ball and Power Up Ball for the special rate of $25 when you add the Therapy Ball Bundle to your course registration (S&H fees may apply^). Take an additional discount of $15 per participant for groups of 3 or more individuals enrolling simultaneously under the same web-order. List the anatomical components of the inner and outer core. Identify the significance of vestibular visual and auditory input for core development. 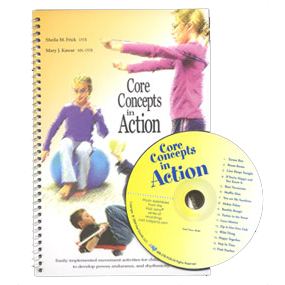 Select three strategies that activate inner core for the purpose of stability and self-regulation. Underline the importance of complete expression and integration of the Moro and Tonic Labyrinthine reflex for core development and self-regulation. Recognize the importance of respiratory patterns and their relationship to core activation. Vital Links is an AOTA approved provider of continuing education. Participants are eligible to receive 7.0 contact hours or 0.7 AOTA CEUs for this course. Each participant is recommended to have a yoga mat/towel and gym ball (fits you to sit at 90/90) available during the course to utilize during online labs. The instructor will demonstrate the use of the Gertie Ball and the Power Up Ball throughout the course. Though they are not required to attend the course; access to these therapy balls can provide participants a hands-on experience during online demonstrations. You can receive both therapy balls for the special rate of $25 when you add the Therapy Ball Bundle to your course registration (S&H fees may apply^). Registrants will receive an email within a week of the course containing instructions on how to access the webinar and printable course materials, such as, the PowerPoint handouts. The email address entered under “Attendee #” during online registration will be the address that receives the instructions email. There are basic device requirements for Vital Links webinars on LogMeIn’s GoToTraining platform. We have a breakdown of device requirements and internet connections that will assist you. View our Support section for more information. It is each registrant’s responsibility to ensure his/her device is compatible with the noted platform and services. Contact Us if you have questions regarding compatibility. In compliance with the Americans with Disabilities Act, Vital Links will make every effort to honor requests for reasonable accommodations made by individuals with disabilities, including but not limited to written transcripts, multiple viewing attempts, and increased amount of time to complete training activities. It is a priority for Vital Links to ensure participation in all courses and activities for all individuals. Vital Links is committed to ensuring non-discrimination and to resolving any complaints related to a disability in a prompt and equitable manner. Cancellations requesting a refund must be in writing and received by Vital Links two weeks prior to the course; refunds will not be granted after that date. Approved refunds will be issued after the final course date (minus $50 processing fee). Cancellation requests may transfer full credit towards another Vital Links course if notification is received in writing at least 7 business days prior to the start date. Vital Links is not responsible for device compatibility issues, and it is each registrant’s responsibility to ensure his/her device is compatible with the noted platform and services. Any difficulty with compatibility is not grounds for a refund after the live webinar session begins. Vital Links reserves the right to cancel any course with due cause and refund in full. If you choose to register via Purchase Order, please attach a scanned copy of your completed and signed form to your “shopping cart” during checkout. Otherwise, you may fax the form to: 1-866-636-9720. Note: please add an administrative fee of $15.00 to each order submitted via Purchase Order. Registrations submitted via Purchase Order Payment will not be processed until the Purchase Order form is received by Vital Links. An international shipping fee of $50.95 applies for products shipped to an address outside of the United States. *This is a Live course. Full Attendance during the hours of this webinar is expected.